"In everything God works for good for those who love Him ... who are called according to His purpose." The Presbyterian Church of Waltham has stood as the sole witness to the resurrection of Christ in this community for nearly one hundred and sixty years. 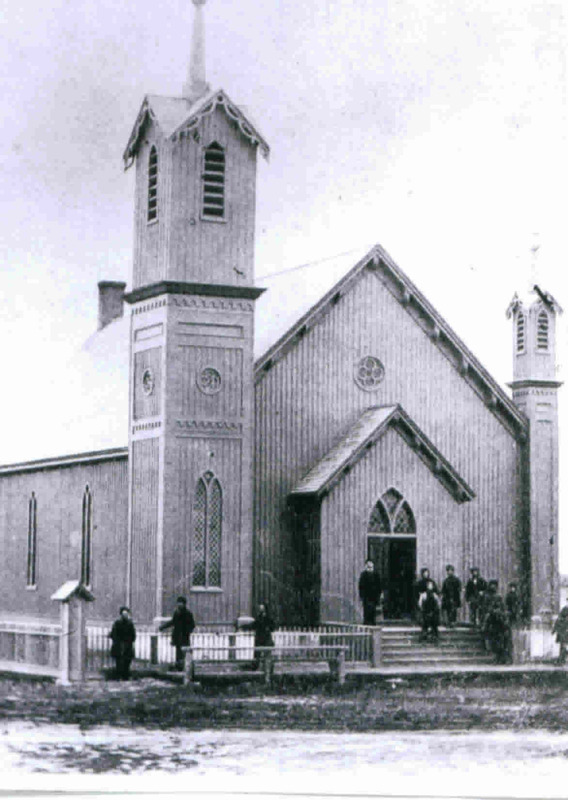 A meeting was called on December 28, 1849 for the purpose of establishing a church in Waltham Township. Seventeen persons, by examination, voted to be constituted into a church and to be, by denomination, the Presbyterian Church of Waltham. Rev. S. H. Baldwin was called as the first pastor. Prayer meetings began in a local barn, later to be held in a log schoolhouse located one mile north of the present site of 809 N. 3450th Rd, Utica, Illinois. The schoolhouse accommodated the growing congregation for years. In 1853, a temporary structure was constructed and utilized. Another building (photo to left), built in 1866, served for one hundred years. It is referred to by many as the "old church,"
Dedication of our present church building (see photo below) took place on June 6, 1965. Through the years, since its inception, the church has made the transition from an agricultural based congregation to one of diversity, representing many professions and trades. The majority of the congregation are well educated people who represent a broad range of occupations. Some of these occupations include business, teaching, medical technicians, nurses, engineering and maintenance people and banking & finance. Most of the membership live within 15 miles of the Church. 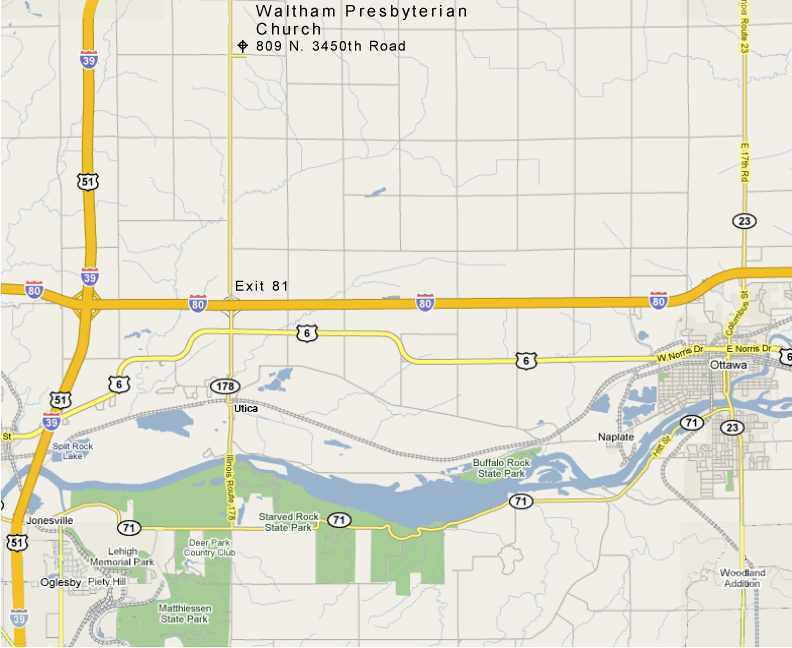 While considered a "rural" church, Waltham is 10 to 12 miles away from 3 larger towns (Ottawa, LaSalle/Peru, and Mendota). There are also very good educational facilities in the area. Waltham Grade School, which houses grades Kindergarten through Eighth Grade. There are 4 high schools in the area. Illinois Valley Community College is approximately 20 miles away. Northern Illinois University and Illinois State University are both about 60 miles away. There are 4 hospitals within a 25 miles radius. 1999 was a year of rejoicing for young and old alike, remembering with gratitude past generations who left a great heritage for us. We celebrated throughout the year with banners and bagpipes, music and memorabilia, and prayer and praise to God our Father for His eternal grace. There are three state parks nearby along the Illinois River.